"This very thick book makes a fast entertaining read that illuminates facts about the times on almost every page. It serves an appropriate tribute to the Americans of the First War on the centennial of their service and sacrifice." In 1917, the United States went into a world war with an army inadequate to meet even the needs of a national defense force, as made obvious by the Poncho Villa Campaign of 1916. The conflict lasted only a matter of months but America prepared for it as if the war could end at any moment and as if it would go on for years. The scale of the preparations for the war effort became as nationwide as the American Revolution and the Civil War. The United States within months "deployed two million troops to France," without adequate training, equipment, or even uniforms. General John J. Pershing noted that his army consisted of four different militaries from three different traditions. Geoffrey Wawro argues, however, that the hand of Providence did not save the western allies "but it was the hand of America." The war also met needs for a generation of young men. 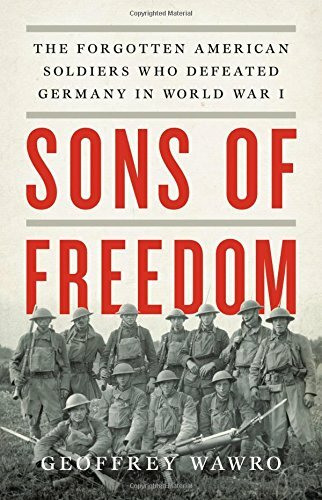 "The sheer variety of Americans who went to war," Geoffrey Wawro writes in Sons of Freedom, "is striking." To make his point, he starts with "a short list" of "professional athletes at the height of their careers." The Americans set out to find, prove, or represent different things. President Theodore Roosevelt's four sons went (two wounded and one killed in combat). All-American football star Hamilton Fish III served to "make a point that black soldiers were as good as white ones." He later served 25 years in Congress. Other veterans would include inventors, meat packers, musicians, poets, scientists, and on and on. Civilians and soldiers who made this special European tour included four future presidents of the United States and a galaxy of other military and political figures. Not everyone went on to a successful career. They included both "Walter Short and Husband Kimmel, the general and the admiral who would be overwhelmed by the Japanese sneak attack at Pearl Harbor." That so many Americans connected to the First World War survived to earn fame, the author attributes to the war ending so quickly and "whereas 90 percent of the Civil War soldiers saw combat, only 40 percent" of United States soldiers ("doughboys") did. Disease in both conflicts set aside, the author does wonder about the 117,000 dead in World War I "rendered silent by a history that hasn't given them their due." Contrary to the title, however, this volume is actually a solid contribution to scholarship on the general history of the United States military in the First World War rather than a doughboy who's who. That book on the lives of the American survivors must wait for another time. This detailed account of America's war experience opens much new to popular conceptions of "the Great War." The author "worked successively through American, British, French, German, and Austrian Archives" to "appreciate what a muddy understanding we have of how World War I ended." Even his brief accounts of the Lost Brigade and of Sergeant York would surprise many readers. Wawro writes an engrossing chapter on the bankruptcy of blood and money by Britain, France, Italy, and Russia in the first two years of the war. The numbers of lives lost reached unimaginably appalling numbers even to sensibilities in the 21st century. The author then turns to the widespread opposition to the United States entering the war included strategic concerns about Britain's, Japan's, Italy's, and Russia's ambitions and hatred of Britain, Italy, and Russia by the waves of immigrants to America. Some Americans feared that loans to Britain end up used "to oppose American interests after the war." Even selling to the British-French coalition drove up the "prices of bread and sugar" at a time when taxes went up for national defense. Farm workers left the fields for the more lucrative factory jobs "causing a plunge in food production." Wheat production in 1916 fell to less than half of 1915 and even wool became scarce. Americans: "we're being asked to cut back on their consumption." Sale of coal to the allied war effort meant "Americans had to go a day or two every week without heat or light." The consequences of the corporations of neutral American profiting from the war have ramifications today. "Until 1914, there'd been no arms industry" to create more shortages of skilled labor. The United States supplied "25 percent of the guns and munitions consumed by the allies." Even the Federal Reserve called for a ban on loans to the allies "to stop the punishing exports of food and raw materials" as weapons or otherwise. The United States faced losing a war where it officially had neutral status. German Americans used these statistics to seek "an embargo on exports of wheat and flower." They represented at least 20% of the population of the United States and "had been among America's most admired nationalities before the war." The remaining chapters tell how the American army not only stood up to but defeated the battle-hardened German forces, who became a bedraggled reality in an historically short time. Even finding the ships to transport the American divisions became an epic struggle. This very thick book makes a fast entertaining read that illuminates facts about the times on almost every page. It serves an appropriate tribute to the Americans of the First War on the centennial of their service and sacrifice.